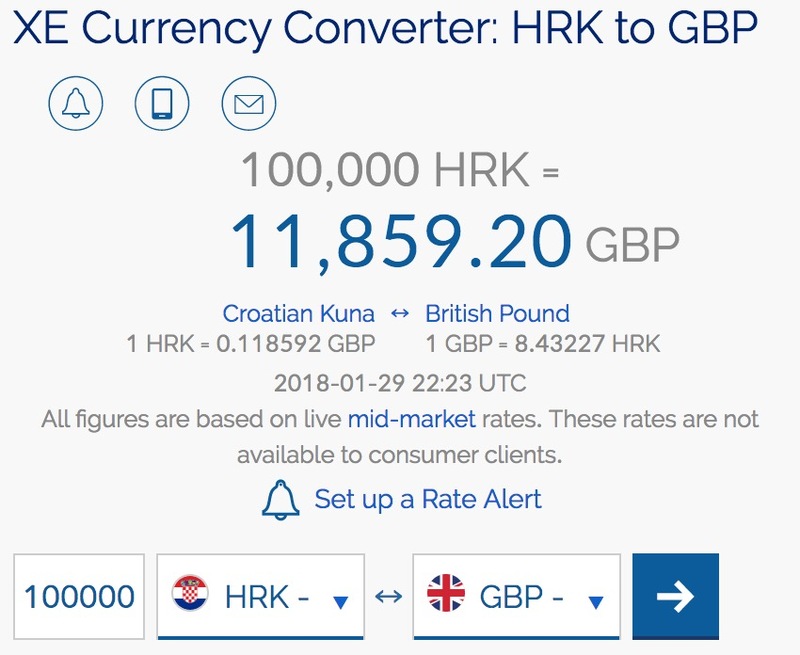 What is the value of a 100,000 Republika Hrvatska banknote? We have been asked by several customers about the value of their 100,000 and 50,000 Republika Hrvatska banknotes. In this blog post we will do our best to explain the value of Croatian Dinara banknotes issued in 1993. Croatian Dinara banknotes were first issued in 1991 when Croatia became independent. The Balkan country dissolved its association with Yugoslavia. 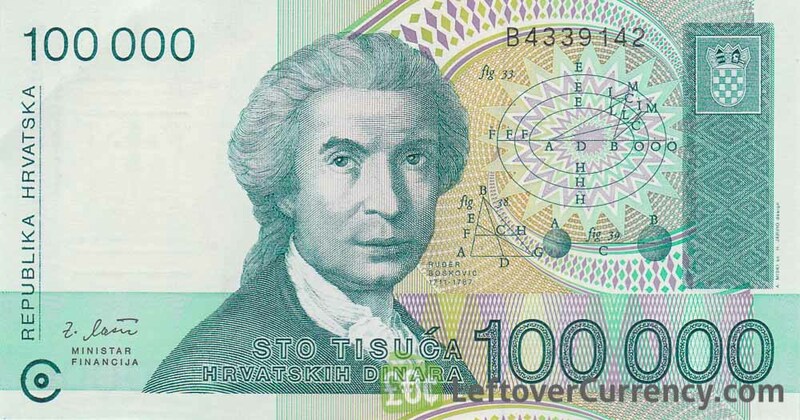 Croatia needed a new currency to replace the Yugoslav Dinar: the Croatian Dinar. 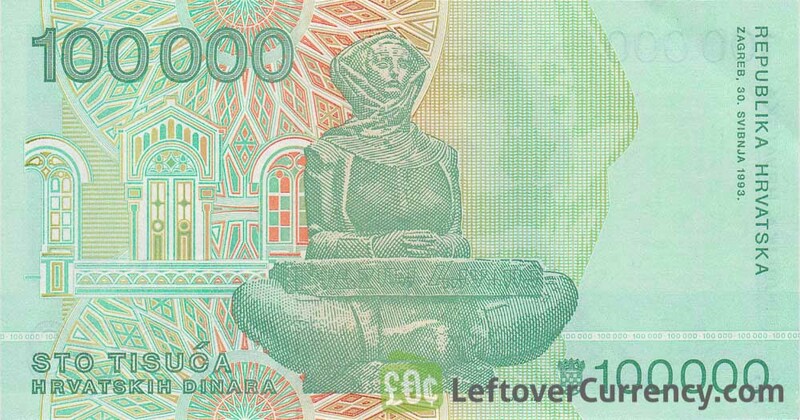 Provisional banknotes of 1 to 1,000 dinara were issued in 1991. They all had the same design. New banknotes of 2,000, 5,000 and 10,000 dinara were issued in 1992. The two highest value dinara banknotes were issued in 1993: those of 50,000 dinara and 100,000 dinara. Text on the 100,000 Croatian Dinara banknote reads “Sto tisuća Hrvatskih Dinara” and “100000 Republika Hrvatska”. It is dated 30 May 1993 (Zagreb, 30. Svibnja 1993). The 100,000 Republika Hrvatska banknote is the highest value banknote of the former currency of Croatia, the Croatian Dinar. 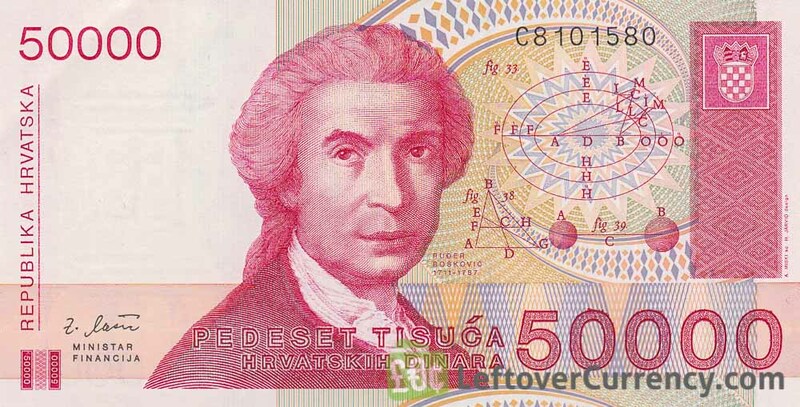 Text on the 50,000 Croatian Dinara banknote reads “Pedeset tisuća Hrvatskih Dinara” and “50000 Republika Hrvatska”. It is dated 30 May 1993 (Zagreb, 30. Svibnja 1993). The 50,000 Republika Hrvatska banknote is the second highest value banknote of the former currency of Croatia, the Croatian Dinar. Are these Hrvatskih Dinara banknotes worth many thousands? 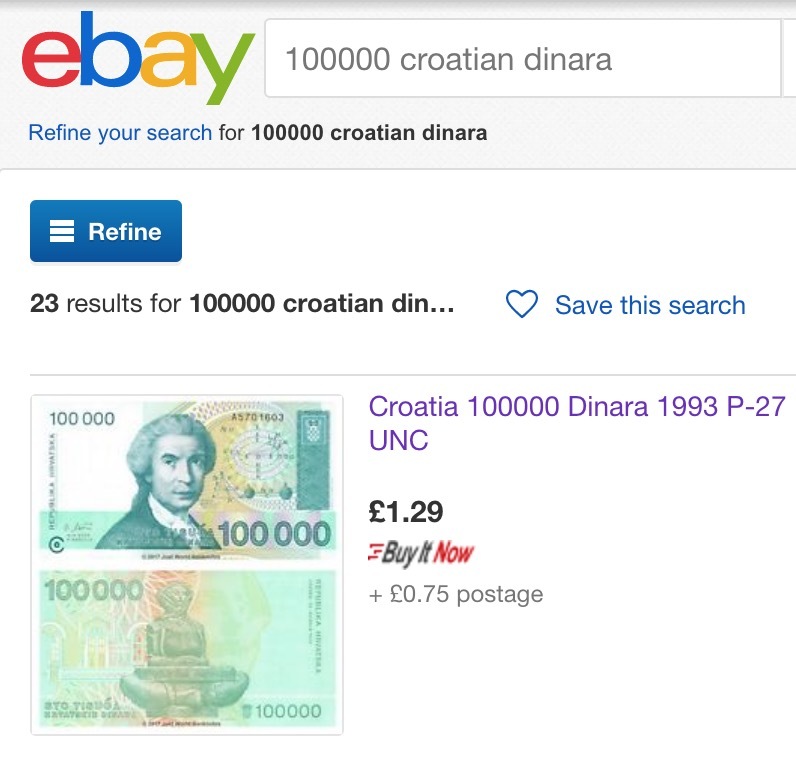 What is the value of 100,000 dinara and 50,000 dinara banknotes from Croatia? Can we use a currency converter to find out what these Hrvatskih Dinara banknotes are worth? Is this correct? Does that mean you can exchange these Croatian Dinar banknotes for a nice amount of extra cash? Maybe splash out on a luxury cruise holiday to Croatia? Unfortunately not. 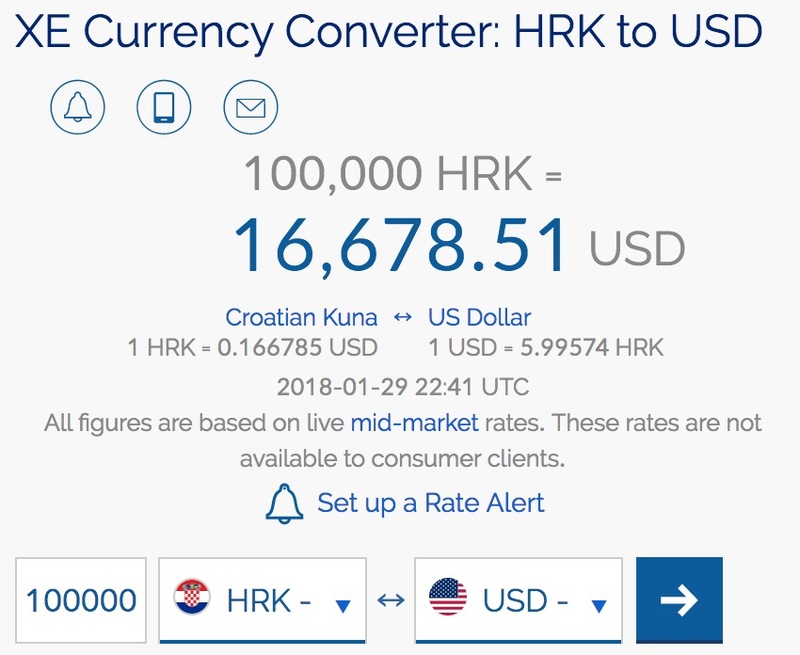 The high values shown here are for 100,000 and 50,000 Croatian Kuna. But these 100,000 and 50,000 Republika Hrvatska banknotes are Croatian Dinars, not kunas. The Croatian Dinar was replaced by the Croatian Kuna in 1994, at a ratio of 1000 dinara for 1 kuna. As a result of very high inflation, the Croatian Dinar lost its value quickly. In 1993, Croatian inflation was as high as 1500%. The highest value 100,000 Republika Hrvatska banknote was replaced by a new banknote of 100 kuna in 1994. The second highest value 50,000 Republika Hrvatska banknote was replaced by a new banknote of 50 kuna in 1994. Does that mean you can exchange these 50,000 and 100,000 Croatian Dinara banknotes for these amounts? Again, unfortunately not. The exchange deadline for Hrvatskih Dinara banknotes expired shortly after they were replaced by the Kuna banknotes. Croatian Dinara banknotes have no more monetary value and should be considered as collectable items, or so called ‘numismatic pieces’. So are the 50,000 and 100,000 dinara banknotes maybe rare collector items with a high collector’s value? Again, no. In 1996, the Croatian National Bank flooded the collector market with 600,000 sets of invalid dinar banknotes in denominations of 1, 5, 10, 25, 100, 500, 1,000, 2,000, 5,000, 10,000, 50,000 and 100,000 Croatian Dinar series, in uncirculated mint condition in the original packaging of cash receivers. 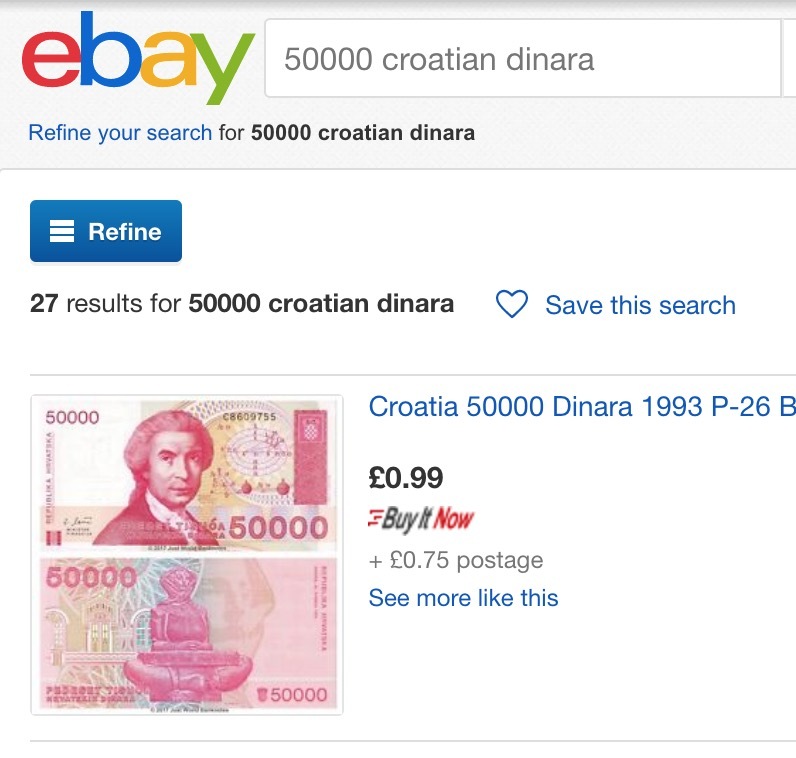 Unfortunately the value of a 50,000 dinara or 100,000 dinara banknote from Croatia is very low. Around $1 US dollar per piece. These banknotes have no monetary value and also lack any real collectable value. 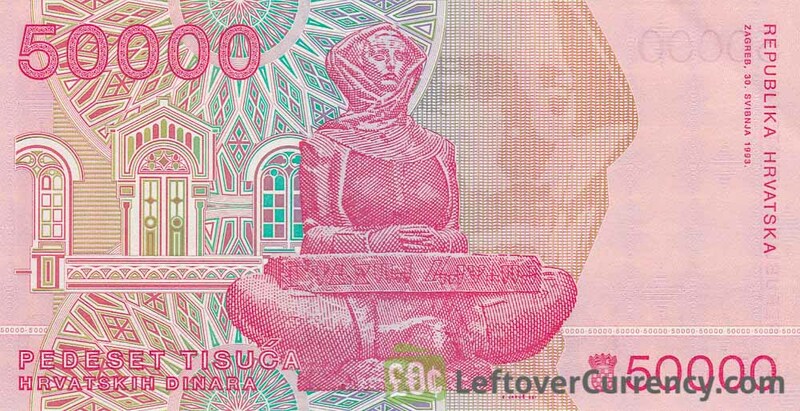 For these reasons, we don’t exchange Croatian Dinara banknotes at Leftover Currency. Mario Van Poppel is the founder and director of Leftover Currency. What started as a hobby, collecting world banknotes, evolved into a fulltime job, running a successful online bureau de change. Mario is still a collector of pre-Euro banknotes and a member of the IBNS. You, like many people, might have some leftover foreign coins and banknotes, tucked away somewhere in a drawer. Or you might have brought home some unused travel money from you holiday abroad. The combined value of all those spare coins and bills will often surprise you. Why not convert your unused foreign coins and notes to valid cash.